Cosy yet breathable, and highly moisture absorbent, wool is a practical choice for the autumn and winter – if we get a repeat performance of ‘the beast from the east’, your woolies could come in handy for early spring, too. Wool fibres are wavy, which traps dead air (a natural insulator) and creates a buffer against the cold; they also move moisture away from the skin so, even if your woolly jumper is soaking wet, the surface area of your skin stays dry. But woolies do much more than keeping your body temperature stable; a few key pieces can make a magnificent statement in your winter wardrobe. With a vintage vibe, lambswool is a great choice if you’re shopping for woolly jumpers and cardigans this season. The AW18 catwalks were a 70s celebration, so vibrant Fair Isle styles, homespun finishes and wearing a roll neck under everything are looks to experiment with. Oversized knits are another signature trend for this winter and, as Christmas approaches, woolen jumpers with a sequin or two are ideal for work-to-bar outfits. Always treat lambswool as a delicate fibre when you wash: if you’re worried about shrinking your sweaters, Laundrapp’s professionals have decades of experience cleaning and caring for clothes, with every order backed by the Laundrapp Quality Guarantee. Fancy experimenting with different types of wool? Merino is one to watch out for. If you find normal woollies rather ‘itchy’ to wear, merino is a much softer alternative. Finer than standard sheep’s wool, it’s also lightweight and travels well, so it’s perfect if you’re going away for a winter break. Sporty fashion fans rate this fibre as it’s breathable with antibacterial properties, helping you stay fresh. This season, get ready to rock a super-soft A-line merino dress, a stylish crew neck sweater, a fitted fine knit jumper or a cosy, oversized blanket scarf. Most merino fashion is washable, so you can wear it all winter long. Cashmere clothes are made from the wool of cashmere goats and are finer, stronger, softer, lighter and even warmer than lambswool – which explains why cashmere pieces are usually more expensive than other woolly fashion. Cashmere clothes look particularly perfect in solid pastel and muted tones and, if you’re looking for a big-ticket, luxury item for your winter wardrobe, a knee-length, belted cashmere coat is all kinds of elegant and will last for years. Apart from a gentle spot clean at home, caring for cashmere is best left to the professionals – Laundrapp will collect, carefully clean and deliver your cashmere coat back to your home, so there’s no trailing to and from the dry cleaner’s. A tailored look is ideal for the season of special occasions and, if you’re buying off the peg, a wool suit guarantees a certain level of quality and durability. A contemporary two (or three) piece in soft Italian wool, luxurious cashmere or a sleek wool and mohair blend can cut a real dash, as well as keeping you warm and dry. Trends to try this winter include deep red and burgundy shades, country checks, slim fits and alpaca blazers with matching trousers or skirt. Winter woolies aren’t just for outer layers. 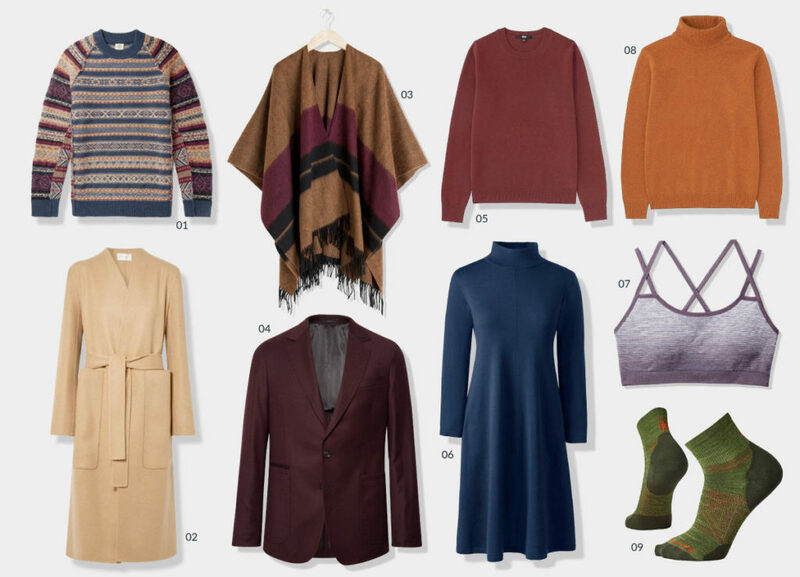 From fine wool blend leggings to ultra-light sweaters, layering-up your woolly fashion is a great way to cope with unpredictable weather, central heating and a smorgasbord of social occasions. Wool layers are also must-haves for skiers and other winter sportspeople. If you’re on a budget, UNIQLO Knitwear has a wide, versatile and inexpensive range of knits, perfect for layering, including 100% lambswool, cashmere and merino. Splashing out? Net-A-Porter Knitwear has a huge selection of knitwear to search, from turtlenecks to heavy knits, with luxury brands including The Row, Tom Ford, Max Mara and Prada. For high performance layers, including base layers, sports bras and socks, covering every sport from running and cycling to fishing and hiking, American brand Smartwool has a brilliant range of products for your perusal.